Summer Basketball Camp starts June 19 at Upper Noe and still has lots of openings available. See the Summer Schedule. Athletic Field - Play Safe, Have Fun! Summer registration begins May 17 at 10 a.m. Please see http://www.noevalleyreccenter.com/at-the-center/sf-rec-and-park-classes/ for a list of classes offered for summer. Lend your experience on Saturday, May 17 from 1-4 p.m. Bring your Noe Valley memorabilia and photos along with yourself, your friends and family to History Day, a discussion activity for neighbors. Think of it as a meet and greet with moderator led activities that will help us all gather our thoughts and express our stories. 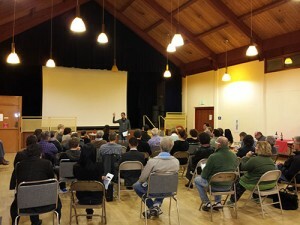 Together, we will define the history of Noe Valley as it relates to our experiences. Whether you live in the valley or in the surrounding hills of Diamond Heights, Glen Park or Bernal, your local insight and perspective will add valuable pages. This activity is free. Local merchants DavidsTea and Whole Foods are providing refreshments. Rec & Park is providing free daycare and all types of activity to keep kids busy in the gym while the adults relax in pleasant conversation in the auditorium. On April 9 at Upper Noe, Vicki Rosen led Upper Noe neighbors in a spirited discussion about two civic projects with local impact. The first was the Northbound San Jose Avenue I-280 Off-Ramp Road Diet Pilot Project that will close a lane of traffic coming into Noe Valley. Upper Noe residents weighed predictions about traffic backups against the concerns of immediate neighbors about speeding, noise, and safety. The second discussion addressed a long-running program designed to underground utilities throughout San Francisco. That program has stalled. San Francisco Coalition to Underground Utilities led a discussion about why that happened and how it can be reinvigorated. The auditorium rarely sees so many adults at once. The RecCenter makes the auditorium available on Wednesday evenings for public meetings. Currently, the Upper Noe Community Recreation Council meets the third Wednesday of each month and Upper Noe Neighbors meets quarterly on the second Wednesday. See Cheryl Woltjen in the office to schedule a date. Phantom Tollbooth - May 9, 7:30 p.m. The Upper Noe auditorium stage will see its first full production drama ever on Friday, May 9 at 7:30 p.m. when Rec & Park’s Junior Acting Troupe, ages 7-12, will perform The Phantom Tollbooth. Admission is free and there will be refreshments and raffle prizes. The performance runs about an hour. Come on down and support these young actors. For years fans of Boston born singer/songwriter Lily Holbrook all had one thing in common…a subway token! Lily was a regular fixture inside the Park Street Subway Station, performing to ever increasing enthusiastic crowds of commuters. With the 2008 release of her new album, “Wicked Ways,” an opening performance for Brian Wilson, Lily is no longer an underground sensation. 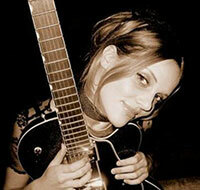 Her music has caused pedestrian traffic jams from Boston’s Harvard Square to San Francisco’s Castro Street. Hear her in the playground from 10 a.m. to noon. Rain moves the event inside. Technically, the fenced in ball field is available by reservation only. Friends sought agreement from Rec & Park early on to make it available as public play space as much as possible. However, reservations and Rec & Park programs always take priority. 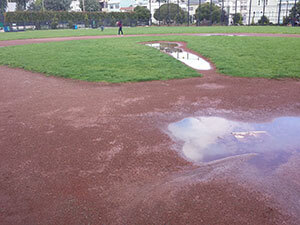 Recent rains have underscored the need to stay off the diamond completely when it is wet because the gravel is easily disturbed then and activity can damage the surface. Please be respectful of this space so that it can remain available and in good condition for our little sluggers. And remember too this is not a regulation size field. As such, it is off limits to teen and adult batting because of the danger that foul and fly balls present to people, dogs and property beyond the fences. Join the efforts to make a Giant Sweep of it on June 14 from 9 a.m. to noon. The Ladybugs’ will combine their quarterly clean up day with a Dept of Public Works program that provides blocks of Giants tickets for groups that log the most volunteer hours. So, lend a hand and take me out to the ball park! FNVRC hosted an amazingly successful Easter Egg Hunt at Douglass Playground on Saturday, April 19. 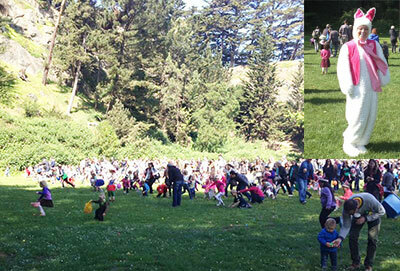 Hundreds of children showed up to meet the Easter Bunny, have their faces painted, color eggs, and of course, scramble in the field for eggs filled with treats. Our thanks go out to Carin O’Hara and the K9 Scrub Club crew for all of their hard work organizing and running this event. Special thanks to all of the kind sponsors who pitched in to make this a memorable day for all of the kids. Join Friends and help make community events happen. Maya gains a view over the weeds as Sky and her pack find some shade during the recent heat wave. Dangerous foxtail grass and other weedy plants are encroaching into the dog run since Rec & Park has decided that regular maintenance, such as cutting the grass, is no longer a priority. Free childcare in the gym. There are no events listed this month. Contact info@noevalleyreccenter.com if you have an event that you would like to list.